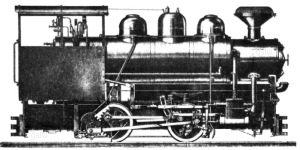 The fixed frame models were similar to a small conventional tank type rod locomotive in outward appearance. the two steam cylinders were mounted horizontally and "in line" with the frame. One was mounted on either side of the forward part of the frame below the smoke box. "The hauling capacities are based on a frictional resistance of 10 pounds per ton for the cars where the track is in good condition"